Manju Gunawardene, the winner of the prestigious Dassis award at the National Innovations exhibition in 2012, secured a Gold prize and Silver for his two inventions at the 41st “Inventions Geneva” exhibition, held on April 10-14. The Geneva event is the largest market place for inventors in the world. 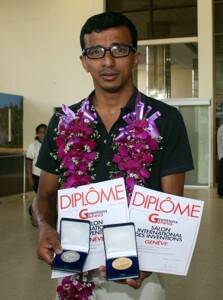 Mr. Gunawardene brought these honours to the country for his two inventions developed using Nanotechnology. The Gold award was presented to his Air Purifying Nano Photocatalytic CFL lamp and the Silver was for the Nano Visible Light Photocatalysis Based Hospital infection Control System, the Sri Lanka Inventors Commission (SLIC) said in a statement. The Gold medal was awarded in the category of “Food stuff, Drinks, Cosmetics, paramedical, health and Hygiene,” for the Nano Photocatalytic CFL lamp which sanitises air by killing micro-organisms present in the air without the use of any harmful sanitizers or any type of chemicals. The innovative coating on the bulb not only kills germs, but also destroys any odors and harmful chemical vapors present in the air. The Silver Medal was awarded in the Category of “Medicine, Surgery, Hygiene, Orthopedics and material for handicap”. Mr Gunawardene is an inventor who hails from Matara. He was a student of Mahanama College and Royal College Colombo. In 1990, he became the junior inventor of the year of Sri Lanka for the development of formalin detector in fish, and with this initiative then developed so many innovative products covering various areas. He developed a novel charge state monitoring system for lead acid batteries and now the world is moving in the same direction in the charge state monitoring technique. He had the primary engineering education from the engineering council of UK and the post graduate qualification from University of Houston Texas on a special scheme of research with Raytheon Aerospace, and currently works at CIC Agri Businesses as a consultant research scientist. He is also the CEO/Principal Research Scientist in Hybrid Technologies Pvt Ltd. He has invented a Specialized Water Conditioner for North Central province which treats drinking and cooking water in Rajarata and other kidney disease affected areas. His participation was sponsored by the SLIC. “This competition was one of the world’s largest in the area of innovation and new product development. It was a tough fight especially in the categories of medicine and energy. The major problems currently world is facing were solved with extremely advanced techniques as well as some remarkably simple devices. I firmly believe that in future Sri Lanka must increase the participation with more futuristic and applied innovation,” the inventor said. “Both my products are focused in critical problem areas the entire world is suffering with. Indoor pollution sources that release gases or particles into the air are the primary cause of indoor air quality problems in homes, offices, restaurants and industrial work environments. Inadequate ventilation can increase indoor pollutant levels by not bringing in enough outdoor air to dilute emissions from indoor sources and by not carrying indoor air pollutants out of the home. High temperature and humidity levels can also increase concentrations of some pollutants. These pollutants are a mix of micro-organisms, chemicals and other contaminants. These pollutants make indoor air 10 times un-cleaned than outdoor air. SLIC Commissioner Deepal Sooriyaarachchi said they were delighted that Sri Lankan inventors continue to prove that they are of world class. to take a closer look at what our inventors are capable of doing and take them to the next level of commercialization. Be angel investors and make a difference is my appeal,” he said. Last year too, the Sri Lankan inventor was sent to the same exhibition by the Commission won a Gold award. This year, the SLIC planning to have the Sahasak-Nimevum national exhibition, for the second successive year, in late December to showcase the talents of the Sri Lankan innovators.